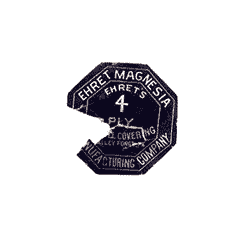 Founded in 1897, the Ehret Magnesia Manufacturing Company achieved commercial success with Thermalite and Durocel, signature brands of asbestos pipe insulation. After combining several limestone mining operations located in what is Pennsylvania’s Valley Forge National Historical Park, Ehret operated an asbestos manufacturing plant on site from the 1890s to the 1970s. Combining imported raw asbestos with materials excavated from a nearby limestone quarry, Ehret produced and distributed an expansive line of thermal insulation products and construction supplies. Unfortunately, Ehret employees and the consumers of their products sometimes developed cancer or other life-threatening respiratory illnesses because of exposure. Ehret began running monthly product advertisements in Asbestos magazine in 1930. That year, the magazine ran an article about pulmonary asbestosis, a chronic disease associated with inhalation of the fibers. And by the late 1950s, Ehret Magnesia chemist John D. McAllister recalled the company’s substantial concern over three Ehret employees who died of lung cancer and nonmalignant lung conditions. Even with knowledge of the toxic mineral’s potentially deadly effects, Ehret continued to manufacture these products. In 1959, the company merged with insulation manufacturer Baldwin-Hill to form Baldwin-Ehret-Hill. The new company operated until 1968, the year it was acquired by Keene Corporation. While the corporation did not manufacture any contaminated products, it did continue to sell them. In an attempt to expand into the fireproofing business, Keene acquired several more companies over the next few years. But by the early 1970s, operations at the manufacturing plant ceased. In 1976, the U.S. Government purchased the Keene manufacturing plant and 46 acres of property to be used by the National Park Service. Keene Corporation began defending personal injury lawsuits as early as 1971. Even though the company purged asbestos-containing materials from its product line the following year, workers exposed decades prior came forward demanding compensation for their related illnesses. As the successor in interest to Ehret Magnesia and Baldwin-Ehret-Hill, Keene inherited liability for the harm caused by their products. In 1981, Keene’s president created Bairnco Corporation, a holding company for the numerous businesses he had acquired. Keene disposed of 2,425 asbestos cases by the end of that year, but Bairnco still faced nearly 9,000 outstanding lawsuits. In 1990 Bairnco parted with the Keene Corporation at a cost of $6 million, but the claims did not cease. One notable lawsuit involved Henry Tragarz, a former sheet metal worker who was exposed to Baldwin-Ehret-Hill’s Thermasil asbestos block at various jobsites throughout the 1960s and ‘70s. While Tragarz rarely handled the mineral himself, he regularly worked alongside insulators and pipefitters whose activities stirred up thick clouds of asbestos dust. The jury returned a $3 million verdict in favor of the plaintiff, holding Keene Corporation and Owens-Corning Fiberglas Company liable for Tragarz’s malignant pleural mesothelioma death. In another lawsuit filed against the Keene Corporation, George Coffman asserted that Keene and eight other defendants were responsible for his substantial lung scarring and asbestosis. Working as an electrician at the Philadelphia Naval Yard from 1951 to 1969, Coffman experienced ongoing exposure while servicing and overhauling various ships and submarines. The jury decided that seven of the defendants, including Keene, substantially contributed to Coffman’s illness. Coffman was awarded $406,000, which included damages for pain and suffering, emotional distress and future medical surveillance. Feeling the pressure of more than 100,000 related claims, Keene filed for bankruptcy in 1993. After emerging from bankruptcy in 1996, the company created the Keene Creditors Trust, an asbestos trust fund established to compensate claimants afflicted with related illnesses. Exposed to Asbestos at Ehret Magnesia? Products manufactured by Ehret Magnesia, Baldwin-Ehret-Hill and Keene Corporation put thousands of workers at risk. These companies produced many asbestos-tainted products that affected several industries, most frequently harming workers in construction and shipbuilding. Most at risk, however, were Ehret Magnesia and Keene Corporation employees who worked at the plant in the Valley Forge National Historical Park from the early 1890s to the 1970s. These workers regularly handled raw asbestos and may have been exposed to waste that was illegally disposed of on site for decades. Ehret Magnesia added amphibole asbestos to its popular Thermolite brand pipe insulation. Although it made for excellent insulation, shipfitters and pipefitters who installed and removed Thermolite coated pipes faced ongoing exposure hazards. The insulation had to be removed prior to pipe repairs, and replacing old pipes required cutting that released toxic particles into the air. Exposure to Thermolite and other Ehret Magnesia insulation products occurred at shipyards, typically during the construction and repair of U.S. Navy and U.S. Coast Guard vessels. Often working in tight quarters with inadequate ventilation, pipefitters, insulators and boilermakers commonly released clouds of toxic dust that threatened the health of all workers in the vicinity. A January 2019 study published in the International Journal of Radiation Biology shows these military professions were among the jobs with the highest potential for asbestos exposure. This group accounts for a large excess of mesothelioma deaths among veterans. Construction workers also suffered exposure from Ehret products such as asbestos insulation cement and asbestos millboard. Electricians, carpenters and other laborers, who shared contaminated worksites also faced risks for exposure. Thermal pipe insulation was Ehret Magnesia’s most popular asbestos-containing product, but the company and its successors manufactured various other types of contaminated products, including asbestos block, asbestos cement and asbestos millboard. In January 1997, State Park workers discovered asbestos-contaminated soil while running fiber optic cable near the former site of Ehret Magnesia’s asbestos plant. It later came to light that Ehret had illegally dumped waste into abandoned quarries and the Schuylkill River for decades. Further, the company did so with permission from the Pennsylvania state government. Within several months, the U.S. Environmental Protection Agency (EPA) determined an emergency removal action was necessary. With an initial investment of $200,000, the EPA fenced off the contaminated area, covered the dangerous materials with soil, wet exposed asbestos to reduce airborne fibers and conducted ongoing sampling of the soil and air. While the EPA deemed the emergency removal action complete by July 1997, future projects are still expected. The site will be closely monitored by the EPA to prevent exposure during the planned reconstruction of the Betzwood Bridge and road improvements. Castleman, B., Asbestos: Medical and Legal Aspects, New York: Aspen Publishers. 2005.